Just like Joshua, God asks us to do impossible things for Him in order for Him to be glorified and made known. The greatest thing that stands out to me in the first chapter of Joshua is when God says, “I will give you every place you set your foot as I promised Moses.” That’s an amazing promise, considering the giants and warriors who dwelled in that land; yet God is God, and He alone could keep His promise. The Israelites went on a conquering journey before they could occupy the land God gave them. During this time they witnessed many amazing things: the Jordan River parts before them, the walls of Jericho fall down by just walking around them and shouting, God rained hailstones on their enemies, and the sun stood still. The people of the land heard of these things, and their hearts melted in fear of God. God tells Joshua the truth of His character before he enters the land He promises them. Why? Because the battles are going to seem impossible, yet they didn’t have to fight them on their own. For us, the support-raising journey is part of the battle. Anytime we step out in faith, Satan is waiting to take us down. However, we have the same promise God gave both Moses and Joshua. If I could write the book of my family’s life, I could write down all the impossible things that happened to us while following after God—we received a free house to stay in and have been given free cars by just praying for them (not to mention the free meals and furniture). We have seen hearts changed and even have watched people join God’s mission that we never thought were possible. All these things happened while we were on the support-raising journey, before we settled into our ministry. When you become discouraged amidst the hard work of raising support, know that you are right where God has you to make the biggest impact for Him. Thank You for never leaving me nor forsaking me. When this journey seems impossible, may I see You at work to do the impossible for me. May I not get discouraged and keep following hard after you in the middle of the battle. Amen. Legacies reflect who we are and what we’ve achieved. Some people are commemorated with things named after them. Others are written in history books with names and facts we have to remember for tests. However, for almost all of us, once we die, our names will be forgotten relatively quickly. This bothers a lot of people, because we want to be remembered. We wrongly associate remembrance with impact. If we don’t do something big and noteworthy, then we won’t have a legacy worth talking about. Even believers can adopt this worldly concept. We want to be remembered like Jim Elliot, Billy Graham and even Mother Theresa. This is not a bad thing, because these people sacrificed a lot in order for others to encounter Christ. Dreaming big isn’t what gets us into trouble. That’s a good thing when we’re following after God, because He often puts big dreams in our hearts.. The problem comes when we have tunnel vision and focus all our attention on the “big” thing—saving the world—that it causes us to miss what’s right in front of us. God has given each believer his or her own ministry, and it’s pretty simple in theory, just harder to live out when we let our selfishness get in the way. We are to die completely to our own desires and motivations, take up His glorious legacy and make it our own. When we clothe ourselves in His righteousness, then we reflect His glory to the world. This is to be our ministry every single day, and sometimes it may not seem like a very “big” thing to do. Raising support is one of those mundane tasks that can make people want to bang their head against a brick wall. God has called us to do something big, yet we’re stuck doing something so trivial that feels like it’s getting in the way with saving the world. And heaven forbid, if we can’t raise enough, then we’ve failed! Often our eyes can get so fixated on the huge need that weighs on our hearts and stirred us to move in the first place that we miss seeing the impact we can make in the here and now. So, where does the real legacy begin? It began with God loving us so much that He sent His only Son to die a grueling death, so we didn’t have to be eternally separated from Him. This is glorious! Every journey we take, whether whole communities are impacted through our service or one life is changed through seeing our daily actions, we are to live that legacy out. Even still our names will more than likely forgotten, but the impact of that legacy is eternal. Be obedient and dream big, but don’t skip over the mundane stuff that seems pointless. There’s a reason for everything God takes us through. Be wise in reflecting God’s glory on the support-raising journey. He’s not panicked. He’s got the rest of the world in His hands. He just wants you to be faithful in the everyday ministry moments where He’s placed you to make the biggest impact. Whose legacy are you trying to live? Are you trying to make a name for yourself so you’ll be remembered, or are you faithfully living everyday reflecting the promise of God’s legacy? Think of some ways that you can reflect God’s glory to others during the support-raising journey, and try them in your next conversations. “I AM has sent me to you.” That’s a powerful proclamation packed with a lot of meaning. Moses had a big task in front of him. God had charged him with leading the Israelites out of Egypt where they had been slaves for a little over 400 years. Because the Israelites had been embedded into Egypt’s strong economy, Moses wasn’t going to just waltz into Pharaoh’s presence and have him easily cave to his demands. God’s power and glory had to be seen and experienced. I AM —the One who has always existed, is the Father of the Israelites, and who deserves all glory and fame—sent Moses in order for His power to be displayed. Moses not only had to trust that truth, but he also had to encourage the Israelites as well. Therefore, I AM sent him. Wouldn’t it have been easier for Moses if Pharaoh would’ve just said, “Oh, sure, Moses, I understand the power of your God who is the great I AM, so please don’t hesitate to leave. You can feel free to leave as soon as you would like.” God could’ve done exactly that, but instead, God led the Israelites on a journey of trust so they could see the God of their fathers, the Great I AM, display what His greatness. We want the journey to our different ministries to be easy, don’t we? We want God to call us, for us to be able to immediately go, and then to lead thousands of people to Christ overnight. Wouldn’t that be great? But God doesn’t necessarily work that way. In order for us to trust Him and see that the Great I AM is the One who has sent us, He has to do a work in our own lives first. He takes us on a journey of discovery on which as we are learning to trust Him, we show others that we can trust I AM as well. All of this culminates into everything coming together in order for us to have the greatest impact for His glory. Thousands of years have passed since Moses led the Israelites out of Egypt, yet the power behind the “I AM” statement still remains true to this day. “I AM has sent me to you.” He still sends us out, taking us all on a journey of faith to discover the truth behind what it means to trust the great I AM. Therefore, raising support isn’t just a stumbling block we have to trip over to get to our ministries. It’s a preparation phase that has a purpose of its own. It’s a God-ordained journey where He takes us on a journey of faith in which we get to trust Him more and more each day, and allow others to encounter Him as well. Use this time to discover God more intimately. 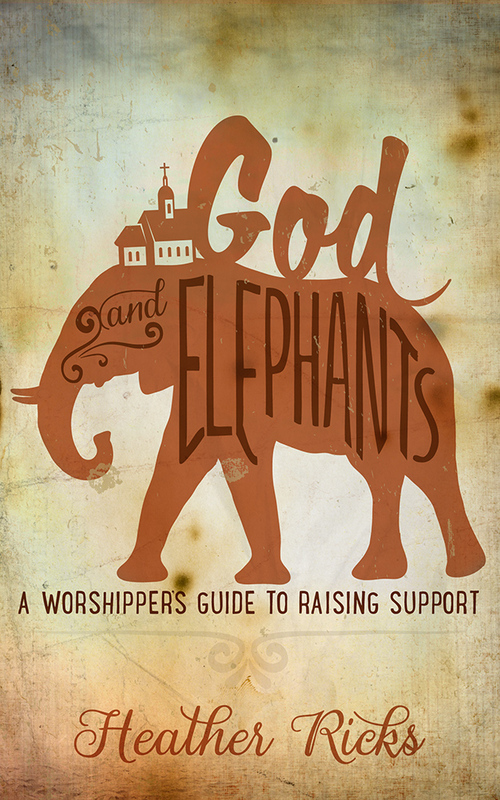 Use the support-raising journey to show others how they, too, can trust God with their money, time and efforts. In the end, when you allow God to work through every circumstance, His glory will be displayed in a much greater way than if we just picked up and went on our own. Who is sending you? Is it the great I AM? If so, relish that fact. Are you doing things by your own strength and might? Surrender your plans to the great I AM in order for His glory to be displayed. How has the support-raising journey looked differently than what you planned? As you look back, how have you seen God at work, using unplanned circumstances for His glory? Following the instructions of the still small voice of our Counselor can be quite difficult. Sadly, I often make it harder than it should be, because when the Holy Spirit speaks, I want to wait for the thundering voice of God to clarify. As humans, we like to wait for a safety net. If God is asking us to give up our job, then we want to know if there’s something that’s going to come along to provide for us financially. If God tells us to march around a city and do crazy things, we want an angel to appear to verify our marching orders. That’s way easier to believe than the invisible promptings of the Holy Spirit—at least we assume it is. In 1 Samuel 3, God had to speak to Eli through Samuel. God had already sent a messenger to Eli to warn him about his family’s fate, if they didn’t turn back to God. However, even with such a blatant message, Eli didn’t listen. Therefore, God verbally spoke to Samuel to explain to Eli what was going to happen to his family. In Samuel’s day, the voice of God was rarely heard, and it came as a complete surprise. The beautiful thing about being a Christian after Jesus’ ascension is the fact that every believer is now given the Holy Spirit to live inside of them to be that voice to guide us. I don’t know about you, but I don’t ever want to be characterized as the one who rarely hears God’s voice all because I’ve forgotten what it sounds like. On the support-raising journey, God doesn’t necessarily give us doomsday messages to speak to households. However, He does call out our names for us to tune in to what He is saying. He has instructions for us that we need to hear, but as we progress along this journey, the busyness and craziness in our lives can often choke out that small voice that is trying to get our attention. In all the chaos, don’t tune out His voice, because His instructions may seem hard or you don’t have the time. I encourage you to get to a quiet place and say, “Speak, for your servant is listening.” When you hear what He is saying, be prepared to take action. We must trust that God has our best interest in mind that will, in turn, be used for His greater glory. What do you need to get rid of in your life in order to hear the voice of God more clearly? What is God telling you to do on this journey? Obey what He is saying.